Overview: In my recent trip to Delhi, I decided to take a very non-touristy trail. I had heard about the remains of Ashoka's edicts and pillar inscriptions within the city of Delhi. After the Kalinga war, Emperor Ashoka traveled across the country to spread his message of Buddhism. This is a minor edict in Greater Kailash area of South Delhi, and is protected inside a concrete cage. The writings are barely visible through the bars, and the approach to this hill is through a well laid path. One of the theories suggests that this site was a part of the ancient trade route linking the Gangetic plains to the north western part of India. Such major and minor rock edicts can be seen all across India, from Delhi to Madhya Pradesh to Chattisgarh to Karnataka. Pillar Inscriptions in Delhi: A couple of pillar inscriptions can be seen in Delhi today. These pillars were quarried and polished at Chunar, near Varanasi. The remains of the ancient quarries can still be seen at Chunar. The polished pillars were transported via boat to the workshops near Varanasi. Somehow, the later ruler discovered the importance of these pillar inscriptions and moved them closer to their own territories. For example, the one pillar I saw inside Ferozeshah Kotla fort was transported from Topra Kalan in Haryana by Ferozeshah Tuglaq in the 13th century. This pillar, erected on top of the Ferozeshah's palace, dates back to 3rd century king Devanampiya Piyadasi's message to hold on to dharma. Along with the earlier inscription, the pillar also records the victories of Visala Deva Vigraharaja IV of the Chauhan dynasty over a Mleccha in Nagari script. Another one I saw was in the Civil Lines area, near Hindu Rao hospital. 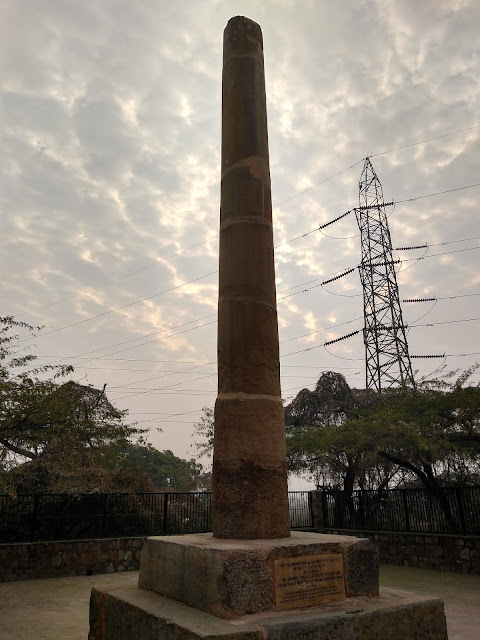 This pillar is also called the Delhi-Meerut pillar as this was originally brought to Delhi from Meerut again by Ferozeshah Tughlaq through Yamuna river. History lies caged in so many places. Nice write-up.